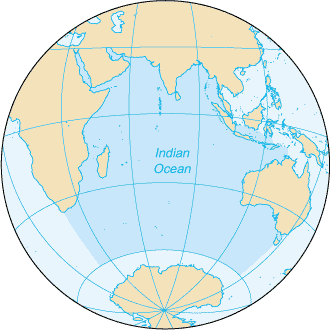 The Indian Ocean is an ocean that is surrounded by Asia to the north, Australia and the Pacific Ocean to the east, the Southern Ocean to the south, and Africa and the Atlantic Ocean to the west. It is smaller than the Pacific and Atlantic Oceans. It was likely the dominant ocean of international travel and trade during the European Dark Ages, when African nations were most able to trade with India, China, Sri Lanka, and other such nations. ↑ World Reference Atlas. 1991. ↑ "Crash Course World History: The Monsoon Marketplace". This page was last edited on 21 April 2017, at 23:05.